As Jupiter is the purser of the vessel, he had to approve the gathering and expenditure on Gumbo and Wine. 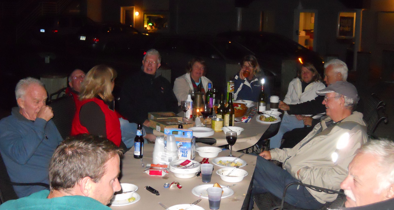 It was a nice gathering of folks at Eastport Yacht Center. The food was very good (as I cooked from 10:30 AM until 5:30 PM to host this fest. Jupiter and Cinco got lots of attention and many of our neighbors had a chance to meet up before many of them head south for the winter. Jupiter thought it was a great success as he got lots of pets. Cinco (for those who know him) was in “hog heaven” getting lots of attention. Hmm.... I’ll have to see if Jupiter will approve this every October.